Connect the connectors on the component HD A/V cable to the corresponding colour input jacks on the TV. On a high-definition TV, if the cable has a yellow RCA composite video connector, leave it disconnected. Note To connect to a standard TV, use only the yellow, red and white connectors. Do not use the other connectors. 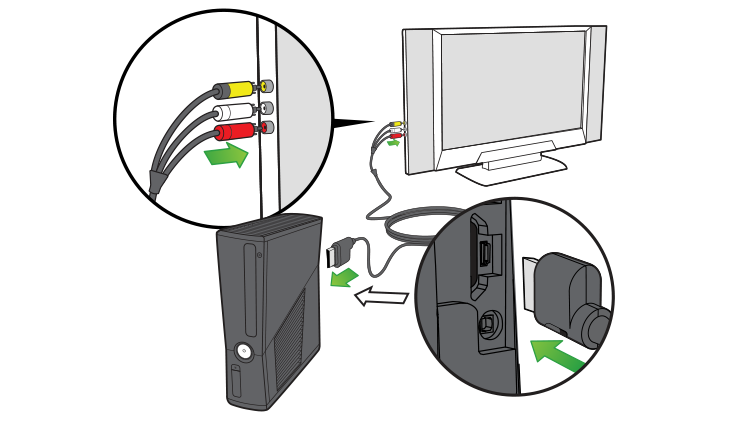 The Xbox 360 VGA HD AV Cable is not usually included in Xbox 360 console bundles. If your display requires this cable, you need to purchase it separately. If you already have the cable but your display does not have a VGA port, you can purchase an adaptor. Plug the A/V connectors into the corresponding colour-coded ports on the SCART adaptor. Plug the A/V cable and the SCART adaptor into an available SCART connection port.